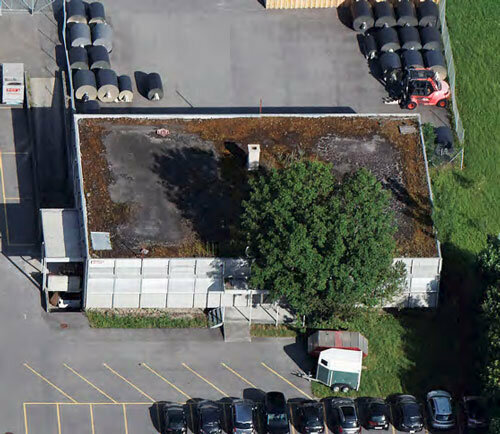 Sika Sarnafil, the premium waterproofing system of global manufacturer Sika, is the best waterproofing system for roofs. 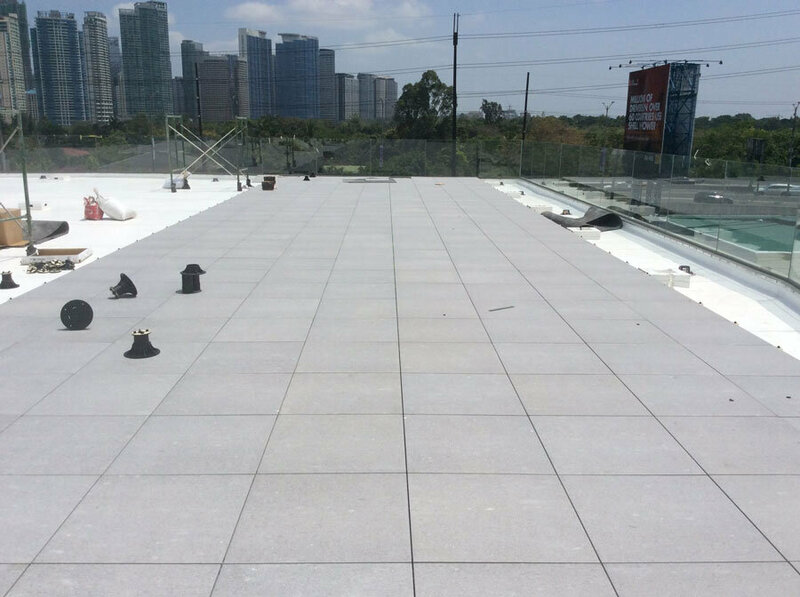 Sika Sarnafil is a PVC membrane and installed as either fully adhered (bonded to substrate using special adhesives), mechanically fixed or ballasted (weighted down with paver blocks, etc.) with membrane overlaps sealed by hot air welding. 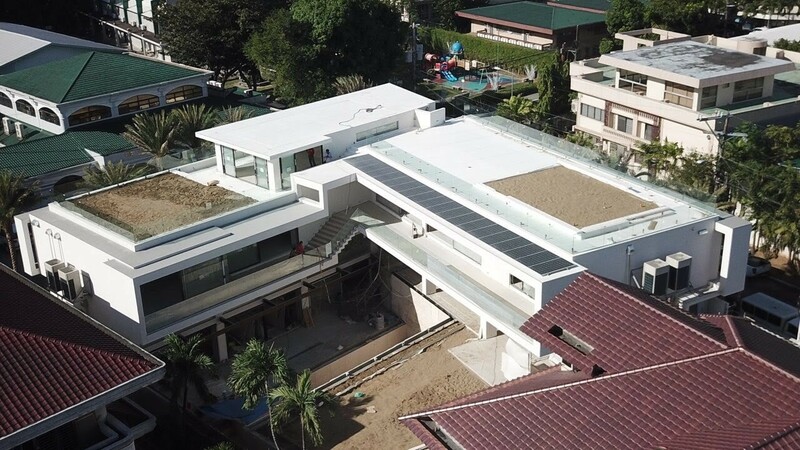 Sarnafil is a complete, ultra-long life waterproofing system free from deficiencies that often plague other roof waterproofing systems and ensures total water tightness of the area where it is installed. Mackintosh Corporation is Certified as Recommended Applicator of Sika Roofing Systems. 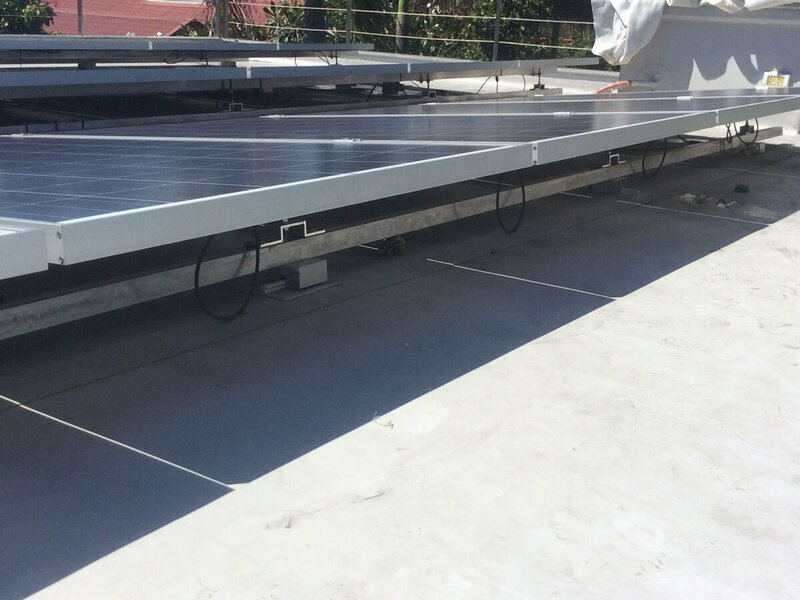 Sarnafil installation at roof decks, green roofs and solar decks. Solar panels mounted on Sika Uni-Anchors. Fully watertight but permeable (allows any trapped moisture to escape; etc. 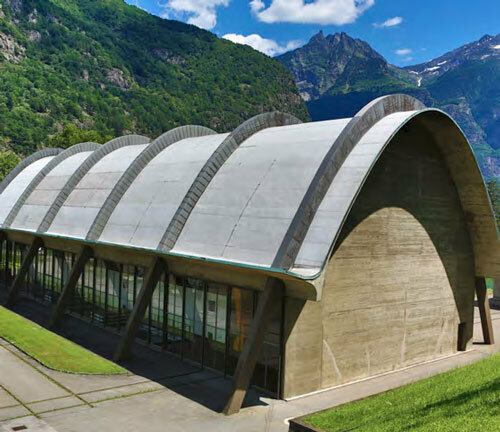 Sika Sarnafil is used for the waterproofing of concrete roofs, metal roofs and green roofs. It is ideal in exposed applications (fully adhered) as energy saving benefits (heat reflectance) can fully enjoyed. 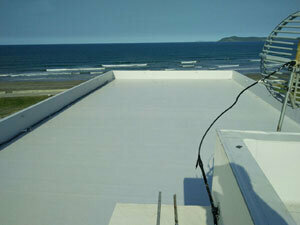 In the ballasted system (no adhesives used) the membrane is either fully or partially concealed. Sika Sarnafil is possibly the best waterproofing system for roof gardens. Sarnafil accessories makes it possible to mount solar panels, air conditioner condenser units, etc. on roof keeping the membrane free from penetration. For those who want peace of mind from leaks, Sika Sarnafil is the waterproofing system – it is the Rolls Royce of waterproofing. Occupational Safety and Health Standards. Mackintosh shall provide equal employment opportunities in hiring, retention, promotion, ranking, transfer, classification and termination without gender bias and discrimination to civil status, race, creed, marital status, pregnancy or physical appearance or people working with disability, sexual orientation, socio-economic status, religion, race, cultural beliefs and legitimately registered institution where one graduated without compromising quality service. Mackintosh Corporation has just completed the cleaning of the windows of Frabelle Business Center in Makati City. Mackintosh deployed bosun’s chairs using rope access as well as a non-invasive cleanser to remove the build-up of acid rain and clean the windows. Prior to starting the project it secured DOLE approval for its Construction Safety and Health Program (CSHP). Safety is of cardinal importance when working at height and Mackintosh ensured the safety of its workers as well as the general public by requiring strict compliance with all safety measures and equipping its personnel with the best safety devices and equipment. Over and above the high grade descending rope workers were also equipped with an independently anchored lifeline. Over and above safety signages, a worker was also deployed on the sidewalk to safely guide pedestrians. Shortly before the start of this project Mackintosh completed the window and cladding cleaning of EMAR Suites along Shaw Boulevard. At the same time it also carried out repairs to defective glass sealant and cladding. This is the second time that the EMAR Suites windows were cleaned. Mackintosh cleaned it in December 2014. Mackintosh Corporation is a licensed waterproofing contractor and branched out to window cleaning as it has a trained workforce doing high rise waterproofing with the full rope access and rappelling skill set. Mackintosh Corporation conducting 1 day Safety training for its workers with CMDF: Mackintosh regularly conducts training sessions for its workers. A major training focus is safety and workers undergo the required 1 day safety orientation as a matter of course and stands firm in its resolve in instilling a culture of safety among its workers and in the creation of a safe workplace. The workers also undergo product application specific training and refreshers. This training is conducted by Mackintosh technical personnel as well as technical personnel of the product manufacturer. Environmental orientations and refreshers are also conducted. Mackintosh Corporation believes that it is essential that key personnel and workers are up to date with the latest product application methodology and innovations. Mackintosh Corporation also specializes in high rise window cleaning. The personnel are trained in mountaineering skills, rope access, safety compliance and window washing/cleaning techniques. They use reinforced laminated bosun’s chairs as a work platform, mountaineering safety harnesses suspended by static Kernmantle rope with a safety lifeline as backup. The services are not limited to window cleaning but also includes exterior building cleaning, pressure washing, high rise exterior repairs, etc. Mackintosh engages in constant research to find the most effective and environmental friendly detergents for window cleaning purposes. Davco K10 Green Sheet R is a high performance, multi-layer, fabric reinforced, waterproofing system that allows for high build up thickness to overcome unevenness of concrete roof surfaces, forming a flexible and yet tough waterproofing membrane with enhanced durability. 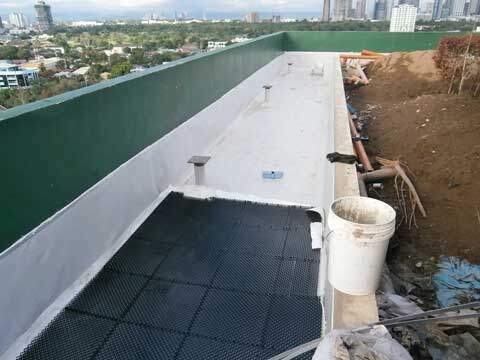 It is available in various colours and accessible to light foot traffic, making it ideal for waterproofing of concrete flat roof area. Davco K10 Green Sheet R can be installed using a special spray equipment or roller. It is specially formulated to be fast drying, increasing productivity and reducing the risk of membrane being wash out due to suddenly occurence of rain on site during installation. Refurbishment of old tile surfaces, concrete roofs and concrete gutters without the need to hack. Replacement alternative to torch on membranes for safe application. It achieves high build up thickness with 2 coats (minimum), and an optional reinforcement mesh where high tensile strength is required. 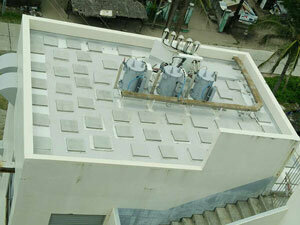 Rejuvenate existing torch on waterproofing in existing buildings. Increases productivity, reduces manpower and time. Bridge cracks and remains flexible in harsh weather condition. Resistant to ultra violet rays, mould & fungus. Mackintosh Corporation held a 1 day Safety orientation for its workers on 22 August 2015. The Safety Orientation was attended by all its workers from all its work sites who had not previously attended this Safety Orientation. Mackintosh Corporation stands firm in its resolve in instilling a culture of safety among its workers and in the creation of a safe workplace. The resource speaker was Engr. Joji Valencia , Safety Consultant from Construction Manpower Development Foundation (CMDF) of CIAP/DTI. Engr Valencia authored the seminar standard for this Safety Orientation on behalf of SMDF and as tasked in terms of Joint Administrative Order No. 01, series of 2011 (DTI, DILG, DPWH, DOLE 7 PRC). Section 12.2 of DOLE Department Order No. 13, series of 1998 requires as follows: “No person shall be deployed in a construction site unless he has undergone a safety and health awareness seminar conducted by the Occupational Safety and Health Center (OSHC), BWC and other concerned offices of DOLE or by safety professionals or safety organizations or other institutions DOLE has accredited or recognized. The DOLE in collaboration with constructors shall promote programs for the implementation of these awareness seminars for construction workers”. Joint Administrative Order No. 01, series of 2011 (DTI, DILG, DPWH, DOLE 7 PRC) defines the safety and health awareness seminar as a 1 day (8 hour) Safety Orientation for Construction Workers.